systems that guests frequently comment about, so I thought it might be worth sharing. 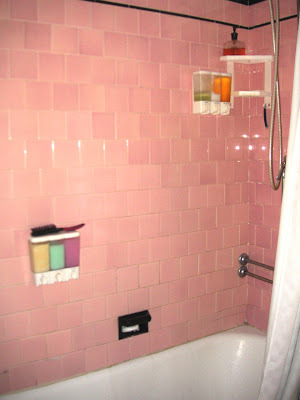 Throughout the house, in the bathtubs/showers and above every sink in the house, we installed liquid soap dispensers. For the main bathroom that is shared by adults and children, I put two sets: one at adult height, and the other at a height that can be reached by a child from the bathtub. The adult-height set holds my (more expensive, not tear-free) shampoo, conditioner, and some baby shampoo. The tub-level set holds the kids' shampoo, conditioner and soap. The baby shampoo in the adult-height dispenser allows an adult to reach it to shampoo a child's head, without having to bend over too far. Can buy in bulk, gallon containers of shampoo. Gallon containers are too heavy to put in the shower.